my new dark salted caramel friends. Yes, years I have waited. 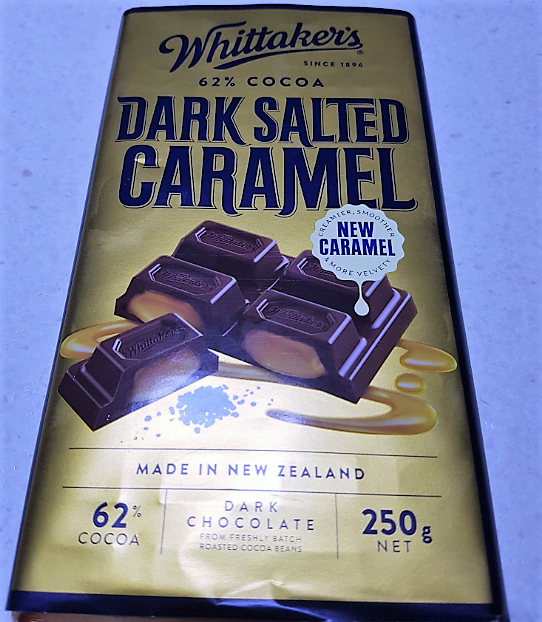 Why nobody made a dark salted caramel chocolate that I could buy on supermarket shelves, I am still baffled by. But here it is. And I am about to try it, right now, while writing this post on the blog. OMG yes it is awesome but a bit up money at $6 for this block. I will stock up when it goes on special. Work has been fabulous. The new job is awesome and I am having a great time, with some minor adjustment issues all on my side. You see, I had fashioned myself a uniform of sorts. It had to be very warm because my last workplace was like being set down on an Arctic ice shelf, with two air-conditioning vents directly above where I stood for much of my day blowing cold air on me. And hilariously in summer, the hotter it got outside, the colder it got inside. I wore Uniqlo heat tech long sleeve turtlenecks and a suedey puffer vest – with great pockets – and I was still freezing most of the time. The new place is warm and if it wasn’t, I would be able to change the temperature myself. There is no uniform and probably no need for one though I could definitely come up with one if I wanted to. I did not realise how much time knowing what I would wear saved me each morning. I pick out my outfit the night before. I also never wore earrings to my old job – it was actually too dangerous with the machinery. I always wore a brooch to make up for it. But now I can wear earrings, and I will. Since the start of the year things have been quite chaotic in this household. With family from interstate visiting we had a lot more outings than usual and we’ve got out of the habit of many household routines, like the regular fortnightly grocery shop. It has been more bitsy shopping here and there, picking up things for a few meals at a time because we weren’t sure where we would be. Batch cooking has also taken a back seat with The Other Half only at work three days a week and only needing three lunches. It is time to get back on the no spend days horse, and time to get back on the grocery budget and meal planning. We’ve started that process today. ← I Don’t Work There Anymore. The new job sounds like an excellent fit for you, but I agree about the difficulty of picking out outfits. I struggled with it when I taught. I had a system of organizing my closet so as not to repeat the same clothes within a week or so. :) I’ve had salted caramel chocolate I love, and other stuff I hated. It’s all about the proportions. Some of it is way too salty for me. Whittaker’s Chocolate was everywhere in NZ and it is very nice. I need this chocolate in my life. Thank you for the PSA. I was underwhelmed by the hot cross buns and Easter eggs on sale this year so I DESERVE this chocolate. Glad you’re loving the new job and also that it has allowed you to be more creative with your work attire. I am so happy to read about the new job! AND… the chocolate and caramel.